Cataract surgery is in the midst of a technological revolution. Advances in microincision surgery and lens implants continue to improve the results we can offer our patients. My staff and I are committed to delivering the best possible results for your cataract surgery utilizing microsurgical techniques with modern foldable intraocular lens (IOL) technology. Over 40,000 patients from the Gulf Coast area have entrusted their vision to my surgical expertise and judgment. My staff and I are honored by the trust these patients have shown in our care and expertise. Our commitment to our patients is simple: To offer the best care possible for your cataracts utilizing expertise, state-of-the-art technology, and a caring and ethical environment. This information is designed to bring a fuller understanding of cataracts, lens implants, and the benefits of microincision surgery. We hope you will find this information and site useful but please remember that it is provided for information and educational purposes only. It should not be considered as a substitute for advice received during your eye examination by your doctor or complete and authoritative. The aim is to make the information as current and accurate as possible but please be warned it is subject to change. Before having cataract surgery it is important you discuss your particular risks / benefits with your doctor. Cataracts are a clouding of the eye's natural lens, that part of the eye responsible for focusing light and producing clear images. Usually a natural result of aging, cataracts are the leading cause of vision loss among adults 55 and older in this country. However, even young adults and children can have cataracts. It should be emphasized that a cataract is NOT a growth or a tumor. In much the same way as the lens of a camera focuses light on the film inside, the eye's natural lens normally works to focus light on the back of the eye (the retina). Just as a dirty camera lens spoils an otherwise perfect picture, vision is impaired when cataracts cloud the natural lens in the eye. Light cannot pass clearly to the retina, and the resulting image appears blurred or distorted. Most cataracts develop slowly over a period of time. A cataract can take months or years to reach a point where it adversely affects your vision. Most cataracts occur as part of the normal aging process and if you live long enough you can expect to develop a cataract (along with gray hair and wrinkles). Cataracts are more common in certain diseases, such as diabetes or patients with a history of smoking abuse and in patients that take certain medications chronically (such as corticosteroids). The most common symptoms of cataract development are blurred or fuzzy vision and sensitivity to light. These symptoms often show themselves as a difficulty in driving, particularly at night. Patients will commonly notice their vision is fluctuating and their eyeglass prescription has to be changed frequently. Certain cataracts make reading especially difficult and patients may notice halos and glare around lights. Colors may not appear as brilliant as they once did and you may notice you need more light to read. Cataracts in general, do NOT cause redness of the eye, itching or pain. The instrumentation, technique, and intraocular lenses used in microincision cataract surgery continue to improve. These improvements are designed to make the surgery safer, allow for quicker recovery of vision, and improve the quality of your vision after surgery. With microincision techniques the majority of patients only have topical drops to numb the eye (a numbing shot is usually not necessary). The Baptist Medical Park Ambulatory Surgical Center and Dr. Ullman are fully committed to utilizing this state-of-the–art microincision technology to offer you the best surgical care possible of your cataracts. Dr. Ullman and his entire staff appreciate that technological advances can never replace good judgment, training and compassion. Our commitment to all of our patients is to utilize state-of-the-art technology in a compassionate, caring and individualized manner. Your vision is precious and we consider it an honor and sacred trust that our patients entrust their vision to our expertise. The first step in microincision cataract surgery is a procedure called phacoemulsification. In this technique, ultrasound vibrations are used to break apart the cataract, fragmenting it into tiny pieces. 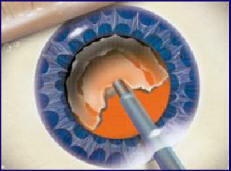 The cataract is then removed using a suction device, leaving behind the intact back portion of the lens capsule. All of this is done through an incision less than 3.0 millimeters in size. Dr. Ullman utilizes the WHITESTAR Signature™ Phacoemulsification System and was instrumental in beta testing this technology. This technology was first available in the Gulf Coast region at the Baptist Medical Park ASC and Dr. Ullman was the first surgeon in the region to utilize this technology. 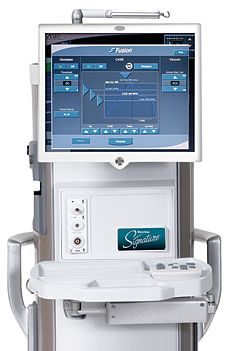 The WHITESTAR Signature™ Phacoemulsification System utilizes eight computer hubs within the system and can deliver a burst of ultrasound energy as small as 1/50th of a second. The tip of the Phacoemulsification machine has a response time of 20 milliseconds (up to 500x / second). The system utilizes Fusion™ Fluidics to increase stability and safety during the microincision cataract surgery. The new Ellips™ Transversal Ultrasound improves the safety and efficiency of the procedure by simultaneously blending longitudinal and transversal ultrasound. Patients commonly mistakenly believe that having cataract surgery will enable them to see perfectly without glasses and have a full range of vision. Having your cataract out and replaced with an intraocular lens should improve your vision. However, the traditional monofocal intraocular lens is a fixed focus lens. It cannot give distance focus one moment and near focus the next. Therefore, even after cataract surgery with a traditional monofocal intraocular lens, glasses will be needed to give you a full range of vision. When you are young the natural lens in the eye works like an auto-focus on a camera. This allows us to shift our focus from far to near automatically. However, as we age and the lens hardens, the ability to shift our focus is lost (this is termed presbyopia). Usually when you are in your 40's you start to lose the ability to focus and now require bifocals or reading glasses for a full range of vision. Traditional lens implants are monofocal (single-focus lenses), meaning they offer vision at one distance only. There are over 50 different implant powers and measurements are performed prior to your surgery to choose an implant power to usually correct your far distance vision. Unlike a glass prescription, there is no opportunity for trial and error in selecting your implant power and there is no guarantee that perfect distance focus will be achieved after your surgery. 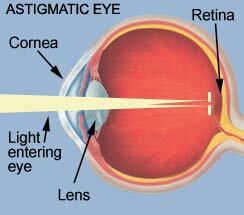 Astigmatism is another reason that distance glasses may be needed (a standard implant will not correct astigmatism). Fortunately, glasses can be used to optimize distance focus and correct any astigmatism after your cataract surgery. The goal of cataract surgery with a standard monofocal implant is to improve your vision and avoid the need for you to be dependent on thick, strong prescription glasses. There are now available premium multifocal IOL’s and premium extended depth of focus IOL’s that have been clinically proven and FDA approved to provide both near and far vision and significantly either reduce or in some cases eliminate the need for glasses after cataract surgery. The multifocal lens implants are designed to produce a dual focus. 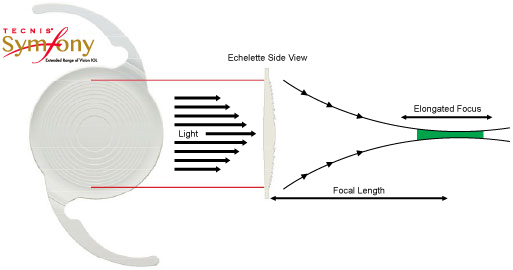 Part of the lens is set for distance vision and part of the lens is set for near vision. The design is different from bifocal glasses where you look through the top portion for distance and bottom for near. With multifocal implants your brain 'learns' to utilize the dual simultaneous image and find the correct focus point. You adapt to the use of the multifocal implants better after it is implanted in both eyes and you have had time to adjust to them. It is not uncommon for a patient to continue to learn how to utilize the dual image and adjust for several months after the implants are placed. The FDA approved TECNIS Symfony® extended depth of focus premium IOL works differently than the multifocal IOL to decrease or even possibly eliminate the need for glasses after cataract surgery. While the multifocal provides a dual simultaneous image the premium TECNIS Symfony® works by extending your depth of focus and thereby improving the range of vision that is clear after cataract surgery. In addition, there is a premium TECNIS Symfony® Toric implant that can address any pre-existing astigmatism that you may have. It must be emphasized that only certain patients are good candidates for the premium implants. Patients who have undergone previous LASIK or RK or have other problems involving the cornea, retina or optic nerve are not ideal candidates for the premium implants. In addition, there are significant tradeoffs when considering any premium implant as compared to a traditional monofocal implant. The premium implant surgery is more expensive than a standard implant. Medicare and other health insurance companies will generally cover the cost of cataract surgery with a traditional monofocal implant. However, the additional expense of the premium implant and required additional procedures are NOT covered by your insurance. It must be remembered the purpose of the premium implant is to reduce your dependence on glasses and are not 'medically necessary' because they have nothing to do with improving the health of your eye. Other tradeoffs include the possibility of significant halos and glare at night. The frequency and severity of this problem is dependent on many factors (pupil size, type of implant utilized, etc.) but cannot always be predicted pre-operatively. It must be emphasized that the premium implants are designed to decrease your dependence on glasses but may not eliminate the need for glasses for some visual tasks. My goal is to offer all of my patient's a complete range of implant options with state-of-the-art microincision cataract surgery in a cost-effective and compassionate manner. The implant decision must be individualized and tailored to your specific visual needs. It must be emphasized that after a thorough eye examination it may be determined that you are not a good candidate for a particular implant. After your evaluation I will discuss with you what I think are your best implant options and what is the best course of action individualized to your particular situation. The premium TECNIS Symfony® Implant is the first and only FDA approved extended depth of focus implant that takes advantage of new optical technology to decrease your dependence on glasses after cataract surgery. 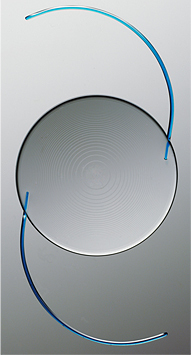 For patients with pre-existing astigmatism, there is a TECNIS Symfony® Toric implant as well. Clinical studies have proven that that new Symfony® extended depth of focus optical technology provides better uncorrected intermediate and near vision without glasses compared to a standard monofocal implant. Dr. Ullman was the first surgeon to implant the TECNIS Symfony® Implant in the Florida Panhandle. More information regarding the TECNIS Symfony® Implant or the TECNIS Symfony® Toric Implant can be obtained at the company’s web site at www.tecnisiol.com/us/patient. The Tecnis® Multifocal IOL features a fully diffractive posterior surface designed to give patients back their youthful vision. Studies reveal the Tecnis® Multifocal IOL provides patients with high quality vision at distance and near, and in any light condition – even in low light. Dr. Ullman was the first surgeon to implant the Tecnis® Multifocal IOL in the Pensacola region and has extensive experience with implantation of multifocal IOL’s. Above is a simulation of post-op vision with a traditional monofocal implant and with the Tecnis® Multifocal Implant. Nearly 9 out of 10 study patients implanted with the Tecnis® Multifocal IOL in both eyes did not require glasses. 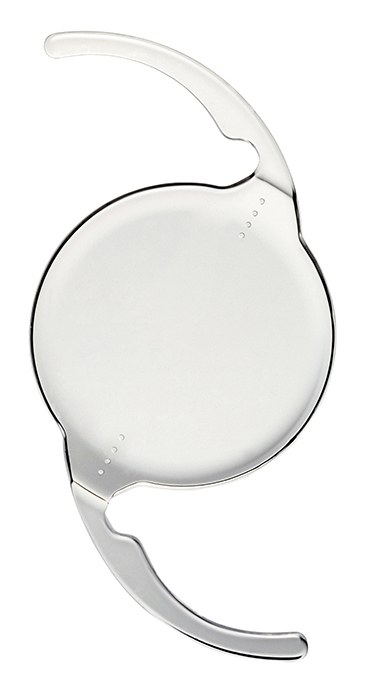 ReSTOR® Aspheric Implant has a uniquely shaped optic, called "apodization" that is new to the field of implants. Apodization is the gradual tapering of the steps of the implant from the center to the outside edge of the lens. These steps result in an increased range of quality of vision as compared to a monofocal implant. A similar technology has been used for years in microscopes and telescopes to improve image quality. The central aspect of this implant is for near vision and the periphery is dedicated to distance vision. This implant excels in distance and close vision (approximately 12 inches) but objects at intermediate distance may still be somewhat out of focus. Please carefully read the section entitled Multifocal Lens Implants which reviews pertinent information regarding the multifocal implant technology. 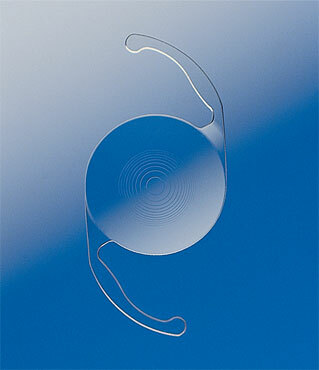 More information regarding the ReSTOR® Multifocal Implant can be obtained at the company's web page at AcrySofReSTOR.com. The surface of the eye (the cornea) normally has a spherical curve, like the shape of a basketball. This helps light rays passing through the cornea to be bent toward the center of the retina and be focused on one spot for clear vision. If you have corneal astigmatism, the surface of the cornea is curved more like a football, with both flatter and steeper curves. When the surface of the cornea has an uneven curvature, vision becomes distorted. This common abnormality, called “corneal astigmatism” causes blurred or distorted vision because light rays are not focused at one spot to provide clear vision. If you have astigmatism, this is usually corrected by glasses with a special astigmatism lens to compensate for your abnormality in your cornea. If you have a cataract and corneal astigmatism you will not regain high-quality uncorrected distance vision after microincision cataract surgery unless your astigmatism is also corrected. One option to correct your pre-existing astigmatism after your surgery is with eyeglasses with an astigmatism correction or a special toric contact lens. If you want to improve your uncorrected distance vision and minimize your dependence on corrective eyewear after cataract surgery there are surgical options for you to consider. Limbal relaxing incisions depend on wound healing which is variable from patient to patient. Therefore, it is not as predictable as we would like (sometimes you get less effect than predicted, sometimes more effect than desired). There are some surgical risks with limbal relaxing incisions (inadvertent perforation, epithelial defects, wound gape and foreign body sensation). The cornea is structurally weakened by these incisions which may leave it more susceptible to rupture if you suffer an injury. The Tecnis Toric Intraocular Lens (IOL) is a recently FDA approved IOL that can be implanted at the time of your cataract surgery to replace your clouded lens. The unique design of the Tecnis Toric makes it possible to reduce or eliminate corneal astigmatism and significantly improve your uncorrected distance vision. This IOL is fixed focus and most patients will still need reading glasses at a minimum after surgery. It must be emphasized that Dr. Ullman cannot guarantee you that your astigmatism will be eliminated. In FDA studies however, 97% of patients that had the Tecnis Toric IOL implanted bilaterally achieved spectacle freedom for distance vision after their surgery. The Tecnis Toric IOL is custom ordered to correct your astigmatism as well as replace the function of your natural lens. Dr. Ullman utilizes special pre-operative tests and a computer program to determine the exact IOL that would be best for you. The Toric IOL is considered a premium IOL and the expense of this IOL and additional procedure is NOT covered by your insurance. Prior to your procedure the office staff will review with you exactly what your additional out of pocket expense would be if you decide to have your astigmatism surgically addressed. If you have a very large amount of astigmatism it may be necessary to utilize the Toric IOL combined with limbal relaxing incisions at the time of your surgery to give you the best post-operative results. Dr. Ullman and his staff are committed to offering all of his patients a complete range of options and to provide state-of-the-art microincision cataract surgery in a cost-effective and compassionate manner. Which IOL and procedure to utilize is an individualized decision and it is important that you be as informed as possible. Certainly there can be no guarantee’s regarding results but Dr. Ullman and his staff will do everything possible to make your microincision cataract surgery successful. Microincision cataract surgery is routinely performed at the Baptist Medical Park ASC on Nine Mile Road and University Parkway on an outpatient basis. You will need to have someone accompany you to the ASC and drive you home after the procedure. You will be given IV sedation and ideally someone should stay with you for the first 24 hours. Except in rare cases, most patients undergo microincision surgery with topical anesthesia. Topical drops will numb your eye only. 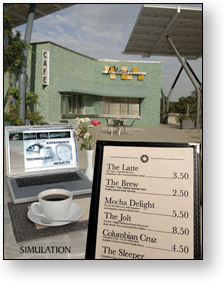 You will be awake during the procedure and IV sedation will be given as necessary to relax you during the procedure. Occasionally, a local anesthesia with a numbing shot is necessary to numb the muscles of your eye. Dr. Ullman will discuss with you what type of anesthesia will be utilized in your particular case. Most patients have no discomfort during the procedure and post-operatively only have a mild foreign body sensation. Prior to the surgery dilating drops are given with antibiotic drops to prepare your eye. These medications are given for approximately two hours prior to your surgery. The microincision surgery itself usually takes only approximately fifteen minutes. However, because of the need to "prepare" your eye you are commonly at the ASC for several hours. It is perfectly normal to be apprehensive about eye surgery and moving the eye during the procedure. However, be assured that the great majority of patients have a pleasant pain free experience. Dr. Ullman and his staff will do everything possible to make sure you are comfortable and relaxed throughout the procedure. Dr. Ullman has a cataract viewing room where family members and friends can view the surgery via closed circuit television as the surgery is occurring. Volunteers will explain what is happening and help answer any questions you may have. Prior to your discharge from the Baptist Medical Park ASC, you will receive extensive written as well as verbal instructions. You will need to be seen the day after your cataract surgery in Dr. Ullman's office. At that time you will be given instructions in regards to your eye drops and care of your eye. Usually patients are then seen in approximately one week. One last visit is scheduled approximately one month after your surgery at which time your prescription for glasses will be given. At each post-operative visit written as well as verbal instructions will be given so there is no confusion with your drops or care of your eye. With modern microincision techniques the majority of patients experience improved vision the day following the surgery. You should be able to resume light activities, such as reading and light work, within a day after your procedure. Your vision will usually progressively improve as your eye heals. Dr. Ullman will tell you when you can resume full activities. Click on the link below to view the one-day post-operative video that you will be shown after your microincision cataract surgery. Cataract surgery utilizing the microincision technique is one of the most successful procedures in all of medicine. The overwhelming majority of cataract surgeries are completely successful (approximately 98%). However, as in any surgery, complications that can permanently affect your vision can occur. Some of the possible complications that can occur include bleeding, lid droop, infection, corneal clouding, swelling in the retina, retinal detachment and in exceptionally rare cases, loss of the eye itself. There are times when a cataract is removed successfully but vision is not improved as expected because of other conditions or diseases of the eye. One such disease is macular degeneration. In this condition, the central part of the retina is damaged. Occasionally, this condition cannot be diagnosed prior to the cataract operation because the presence of the cataract may prevent Dr. Ullman from seeing the macula in sufficient detail. Because cataract surgery has risks it is important to weigh the benefits of surgery in your particular case versus the potential risks. Dr. Ullman will discuss this with you before proceeding with surgery.